Inspired by the Cabernet Sauvignon-dominated blends of Bordeaux’s Left Bank, Jordan Alexander Valley Cabernet Sauvignon is crafted in a similar manner using artistic and stylistic blending techniques. For hundreds of years, the vignerons of Bordeaux have been growing select grapes—Merlot, Cabernet Franc, Petit Verdot and Malbec—to blend with Cabernet Sauvignon. Not only do the characteristics of these varieties beautifully complement each other, but blending allows us to achieve a style that best showcases each vintage’s individuality while delivering the fruit complexity, silky elegance and finesse that Jordan Cabernet Sauvignon has come to be consistently known for. At Jordan, the blending process begins in the vineyard with immaculate care of our estate vines and insistence on the same from our growers. On Winemaker Rob Davis’s morning walks through our roughly 60 different vineyard blocks, he is already formulating the master blends in his mind. He takes into account an endless number of factors specific to each vineyard site, from soil type and clones to row orientation and adaptive farming practices. This is all done in the name of vine balance, which equates to wine balance. A blend of respect, experimentation and empirical wisdom are all crucial parts of our relationship with our growers and ranch manager. Wines of greatness grow from the ground up. Blending evolves once the grapes arrive at the winery. Treated with the same amount of care and scrutiny as the clusters were before harvest, wine components are kept separate by vineyard block, allowing for each to reveal strengths and weaknesses as potential contributors to the master blend. Hedonic tastings are conducted after fermentation, wherein the winemaking staff determines, purely based on tasting assessment, which wines should comprise the Jordan Cabernet Sauvignon barrel blend—the foundation for our master blend. Wines are given classification ranks, and if there is a mediocre tank of wine, it is declassified and sold. While many wineries blend Cabernet Sauvignon wines just before bottling, how we make wine is a bit different. Jordan blends wine components before barreling to enhance the wine’s elegance and finesse. This blend of contributing components marries in towering oak tanks (constructed onsite in 1976), allowing the wine to breathe and develop a deeper complexity as the components harmonize. 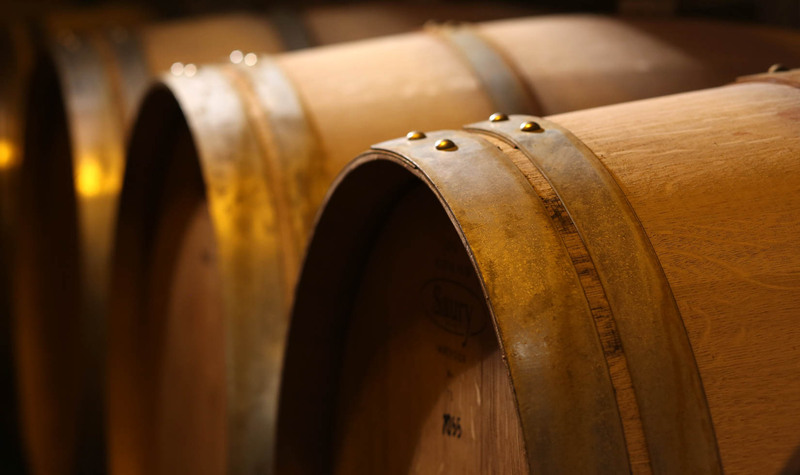 Our approach allows the wine to achieve even greater balance after a year of aging in small oak barrels. Vintage after vintage, no formulas are employed. This artful blend of different Sonoma County vineyards, grape varieties, winemaking techniques, and barrels ensures every vintage of Jordan Cabernet Sauvignon maintains its hallmark elegance and consistent quality.